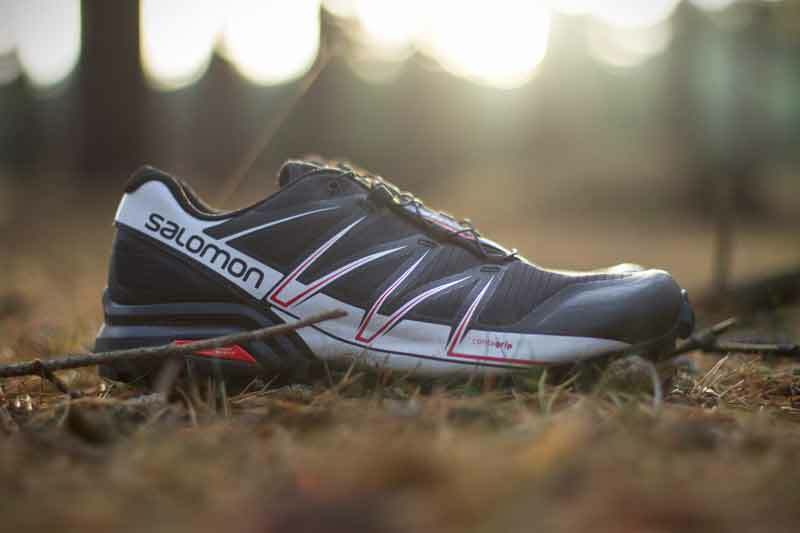 The Salomon Speedcross is an established crud eating, trail munching, race wining shoe. Though something of a Salomon classic, development and improvements continue, along with new variants for specific applications. 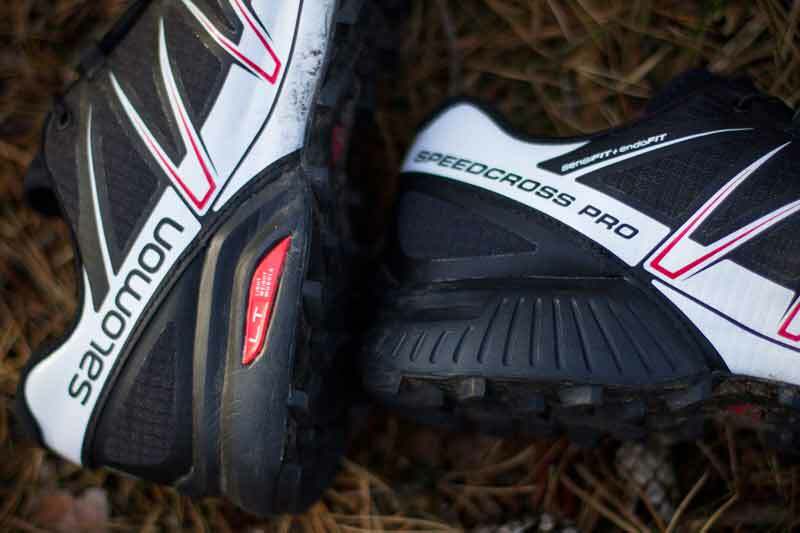 The Speedcross Pro is inspired by Salomon’s S-Lab range, their in house special forces, seeking the grippiest, fastest, lightest shoes they can conjure up. Dressed in red, white and black, these race ready shoes are unmistakable. In my previous review, the Speedcross 3 came out well, with the grip and support offered being noticeable. First up, the unmistakable tread pattern. 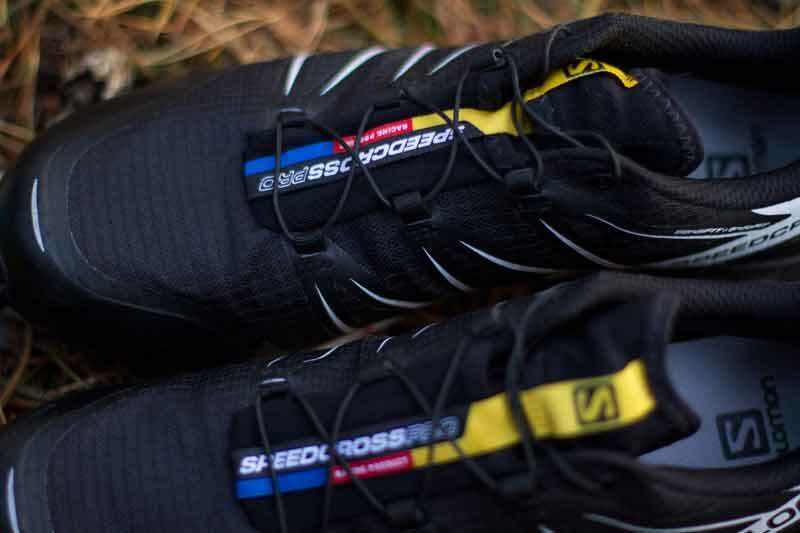 Much like a rhino is famous for its horn, the Speedcross are instantly recognisable for their 6mm lugs sticking proudly from the base of the sole. Comparing to the 3’s, it feels like the compound has been tweaked. Unlike the 3’s, the lugs don’t twist and bend to the same degree when running on harder surfaces, and this was particularly noticed when running down steps. I found the Speedcross 3 really shift around, like jelly under each foot, on the flag stones on the descent from Ben Nevis. However, the Pro is sure footed, yes it prefers mud, snow and all manner of sloppy substances, but it can handle harder terrain better. My first run was around the trails of Rothiemurchus in the Cairngorms, loamy in places, but predominantly hard pack. At no point did I think, bugger, should have brought a less aggressive sole. 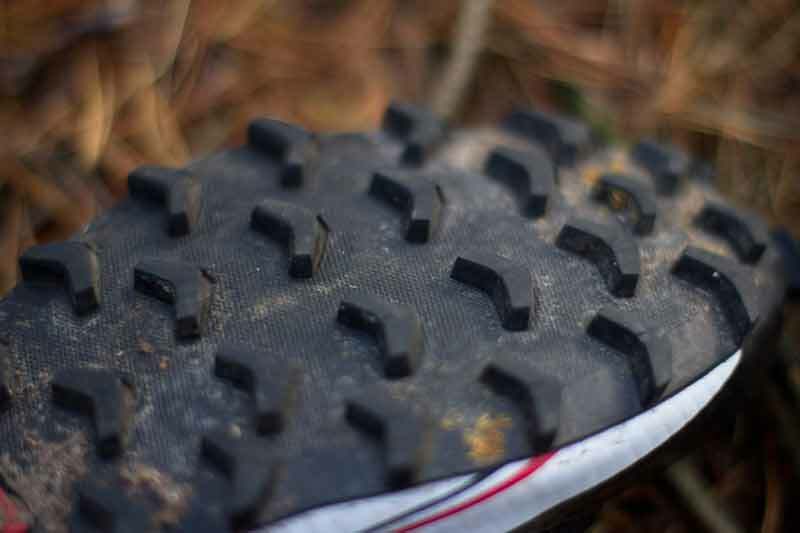 Of course, the Speedcross Vario is purpose built for such terrain, but seldom do most of us travel with an arsenal of different tread patterns, let alone own them. In mud, the ride is predictable and allows you to attack the slop without second guessing the outcome. Though no shoe can keep you in a perfect straight line through a bog infested fell, when you do slide, you feel in control and are able to take the next step without a feeling of impending doom and embarrassment. I can report no bambi legs when going full tilt through a brown abyss. Wear has been reasonable. One thing to remember with aggressive soles is they appreciate mud and all things soft. Take them on the road and they will wear down prematurely. 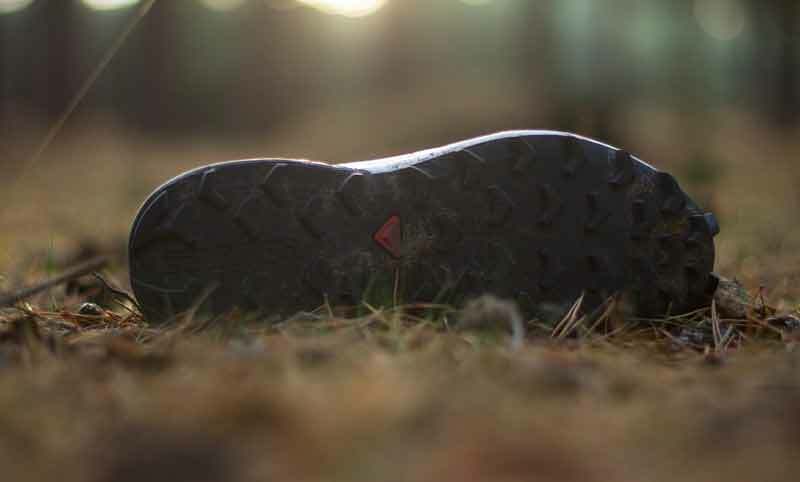 The Contragrip sole leaves no marks, regardless of the surface, other than teeth marks sure to confuse any tracking expert. Wet and dry grip are both plentiful, though due to the deep lugs, best to avoid roots when possible. The Mud Guard provides protection around the base of the entire shoe. Combined with the welded Sensifit, I feel this is why the shoe feels slightly narrower. In truth, until I put on an old pair of Speedcross 3, I didn’t really notice a narrow fit. However, I feel this may be in part to the different way in which they are constructed. There is a greater degree of 3D welding on the Pro model, and the welds and protection offered in and around the toe box are firmer – possibly stiffer. Despite this, I don’t feel they are too tight or narrow. I found my foot felt cradled, rather than pinched or restricted. I wear a UK size 10 and measure as a 9.5. This is my regular practice in trail shoes, given I like a little extra room for when bombing down a descent and hitting something head on the toe box. My feet are reasonably wide and I like to splay my toes. I am undecided whether or not I would appreciate a larger toe box, yes it would be slightly more comfortable and allowing my feet to relax on longer runs. However, when the terrain gets technical, having your feet in place has its advantages. On wet and technical runs, I’ve found I suffer from blisters worse when there is space for toes and socks to move around on descents. Fit is a personal preference, so the best thing to do is head down to the local shop and sink your feet into a pair. 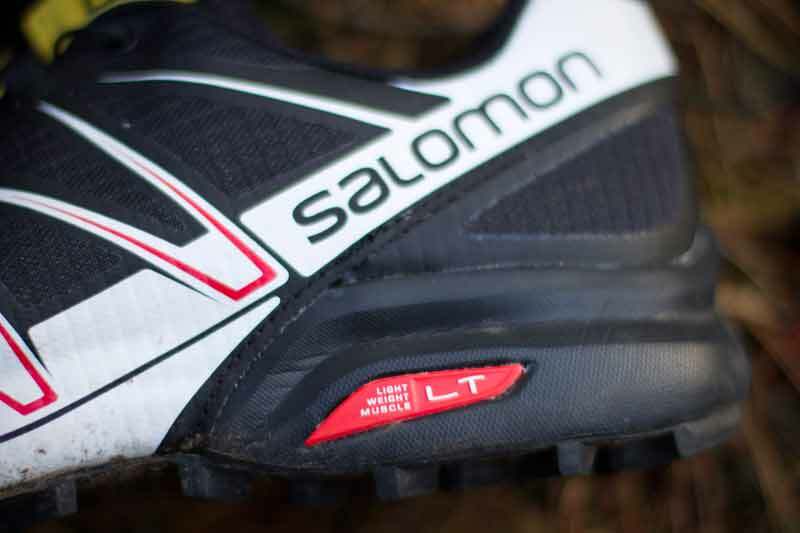 The Sensfit is as good as ever, and so far across all Salomon shoes I have been sent to review or tried on in store, it fits like a glove. The Sensifit hugs the foot, with the Quick Lace System being intuitive and easy to use. Grab, pull and hide the rest of the lace in the lace pocket. The lace pocket itself is now wider and easier to use, I did find previously that on longer runs the laces could break free. The tongue also no longer has any padding, which I see as an improvement. Instead it acts as a cover to keep out those small sharp objects which can cause hot spots and blisters. A large volume padded tongue can restrict getting a close secure fit. At no point have I felt during runs that padding is required, the material does not rub and the profile is lower. In fact, I believe this is beneficial for keeping out mud and debris, along with attaching a running gaiter. The Anti Debris Mesh works well, and feels like it may be slightly tougher than before. Of course, we have to bear in mind that the Speedcross 3’s I have are very well used (some lugs are tearing off) and the addition of greater welding will naturally stiffen materials. A moulded EVA and Lightweight muscle midsole, comprised of a 65C compressed EVA at the top to prevent medial collapse, 60C injected EVA for cushioning and an OS Tendon, provided a soft, supported ride. This combined with a large heel to toe drop, provides a ride that benefits long distances and runners who require that bit more support under their arch. Despite the large cushion, especially in the heel, the trail does not feel dead underfoot and you are able to experience a responsive ride. I have spent the majority of the year running in lower heel/toe drop shoes, but this didn’t compromise the experience, nor have a detrimental effect when switching back. The heel cup is supportive and really allows you to pull the Quick Lace System with confidence, knowing it has a stable platform to work against. The padding remains fairly cushioned and provides a comfortable cradle. As for styling, I’m afraid you are limited to a choice of 4 quite sensible colours, opposed to Salomon’s usual pallet of loud “I am a trail runner!” options. But that said, when your shoe is brown after a morning on the trail, they all look alike. So the Speedcross Pro. It’s not an S-Lab shoe, nor is it the standard cross 3. So what is it? I feel it is a more aggressive, better protected variant, which though slightly heavier, will allow you to attack terrain with as much, if not more ferocity. 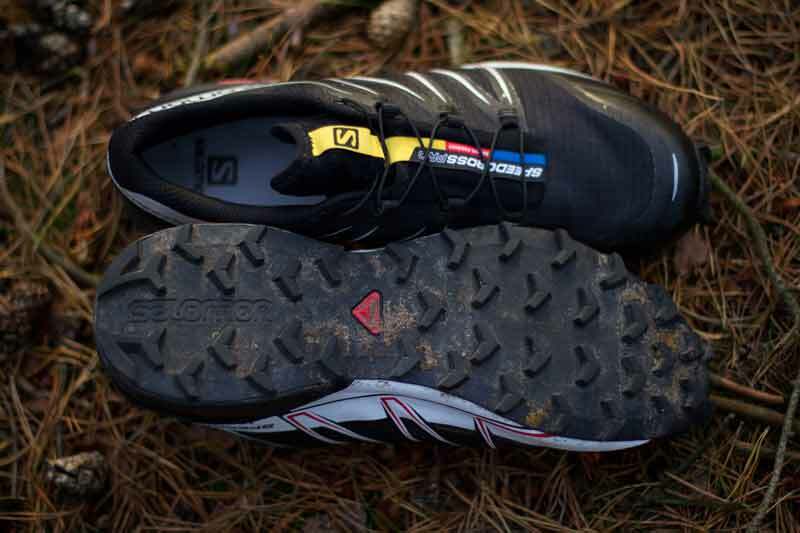 The compound and lugs are better for when you aren’t stuck in the mud, which unless you are obstacle course racing, is all of us and the fit is more precise, though for those with wider feet, it is worth trying on before you purchase. 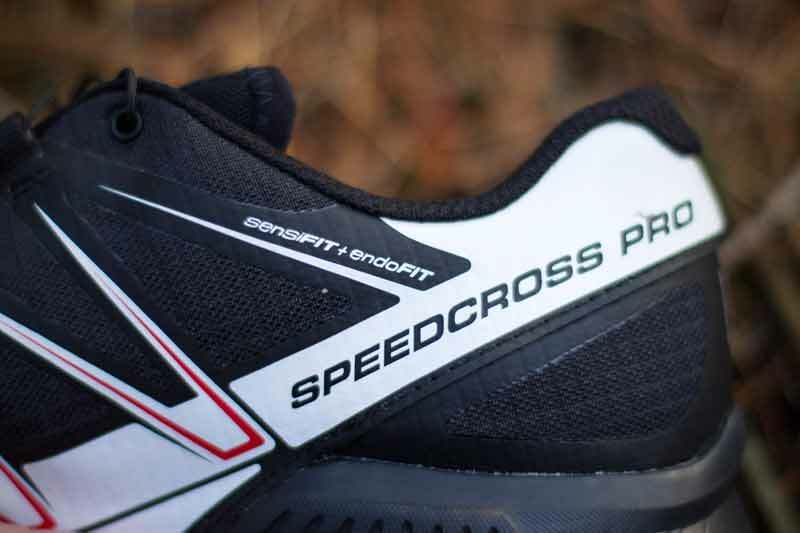 Having put 40 odd miles into them, they are what I wanted the Speedcross 3 to be. Our unseasonal warm and wet trails are in for a surprise.